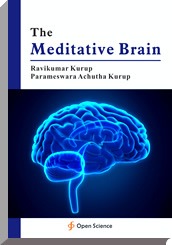 Meditation can modulate body metabolonomics and brain function. Meditation induces heme oxygenase depleting heme from the system leading onto increased porphyrin synthesis. Porphyrins can self organize into self replicating supramolecular structures called porphyrions which are induced by meditative practices. The porphyrins are dipolar molecules and in the setting of membrane intercalated porphyrin mediated sodium potassium ATPase inhibition, produces a pumped phonon system and a Frohlich model of superconductive system mediating quantal perception at normal temperature. Thus the porphyrions mediate quantal perception during meditative trances. The porphyrions have increased quantal perception leading to sensing of low level environmental EMF fields causing prefrontal cortex atrophy, cerebellar dominance and a cerebellar cognitive affective disorder. This leads onto prefrontal cortical dysfunction and lack of functioning of the conscious brain. The cerebellum dominates and the unconscious brain takes over. This leads onto Neanderthalisation of the brain. This produces a sense of the quantal world and a feeling of oneness with the universe. This is the basis of the collective unconscious or spirituality.